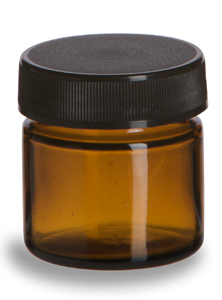 These high quality lab grade Mini Amber Glass Storage jars protect their contents from harmful UV light and greatly reduce exposure to air. These ultra stealth storage containers are perfect mid to long term storage options for all sorts of stuff including spices, dry blends, tobacco, essential oils and concentrates - or most anything else your heart desires. Pop in your pocket, purse, or store neatly on a shelf or in any small space. The mini size holds about 25 ml / 0.85 oz, and is the ultimate in portable storage containers, pick one, or a few, up today! Need something bigger? These jars also come in Small, Medium, and Large sizes.